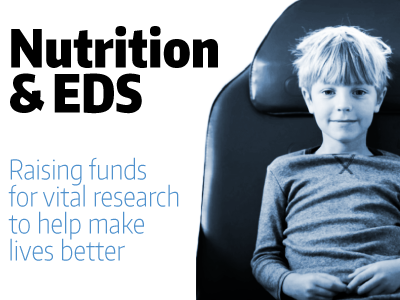 We are urgently trying to raise £250,000 for research to look at the effects of changes to diet on the symptoms of hypermobile EDS (hEDS). hEDS is also associated with a range of gut disorders, including acid reflux and irritable bowel syndrome. There are no drugs that target the connective tissue abnormality. Current treatments include medications to reduce symptoms, alongside physiotherapy for muscle and joint issues. Good nutrition is essential for connective tissue repair and general healing. Certain nutrients are needed for the body to make collagen and support connective tissue function. Identifying specific nutrients needed for connective tissue function is important. This planned research will be conducted by Professor Qasim Aziz and Lisa Jamieson at the Wingate Institute of Neurogastroenterology, Barts & The London School of Medicine & Dentistry, Queen Mary University of London. The study will trial a diet-based nutritional intervention, to determine whether symptoms can be reduced in hEDS patients of any age. This intervention has the potential to improve quality of life of patients with hEDS, through simple, inexpensive but effective dietary measures, while reducing treatment costs. For more information, please visit our Nutrition and EDS page. The Ehlers-Danlos Society is pleased to announce an exciting gene-finding effort for genes associated with the hypermobility form of EDS (hEDS). For more information, click here.